I have been baking a recipe for lemon, poppy seed muffins for some time now. I improved on this one by using lemon flavoured yogurt along with the lemon extract and zest. It was this recipe that inspired me to try my 2 favourite field berries, field berry yogurt, along with fresh berries in the muffin mix. For a half of the above recipe I mashed 1/4 C rasps into the dough and added 1/4 C blueberries gently later in the mix. I filled the muffin cups not quite 3/4 full and then pressed a full, firm, fresh raspberry into the dough, covering it with a Tbs or so of dough. Oh my! I know I always say this is the best thing ever baked, but I really, really like these!!!! Sift together the obove ingredients. 1/2 C fieldberry yogurt -- highest fat % I can find! This recipe makes 6 muffins and can easily be doubled. As above, one whole, fresh raspberry was added to each muffin, whcn in the muffin cup. Bake for 20 minutes at 400F turning at the half. Enjoy!!! Did I say I realllly liked these??? These look great! Would you mind if I featured them on the front page for a bit? 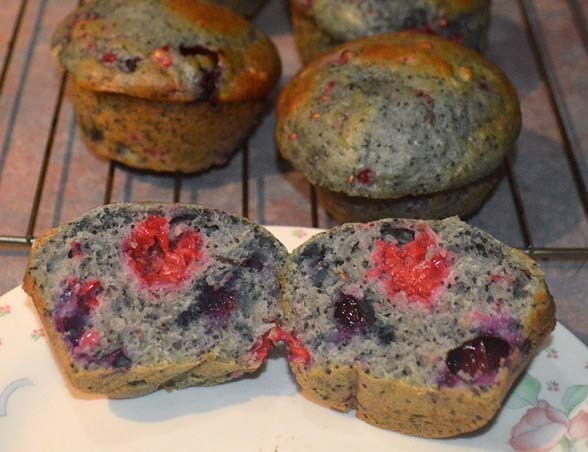 Re Blueberry, raspberry, poppy seed muffins - THANKS! Floyd, I would be most honoured! Many thanks to fellow fresh loafers for all of the kind comments on the muffins! I hope you enjoy these as much as I do. The nice part is that I can mix a batch of 6 before my oven comes up to 400. It is a good thing ski season has started here and I can burn off some of the calories . . . I don't have any fresh berries - but I just stocked up on frozen so I have no excuse not to try these..thanks!! Thanks for sharing. I wish I had one right now to graze on while watching TV :). Wow....all my fav ingredient too! Will make these soon. You must be out skiing : ) Thanks for sharing the recipe! combination of favors. They look delicious. Nice baking and thanks for the recipe. Granadinas, the perfect Christmas cookie! Pulla, fresh flour and HOLY oven spring!